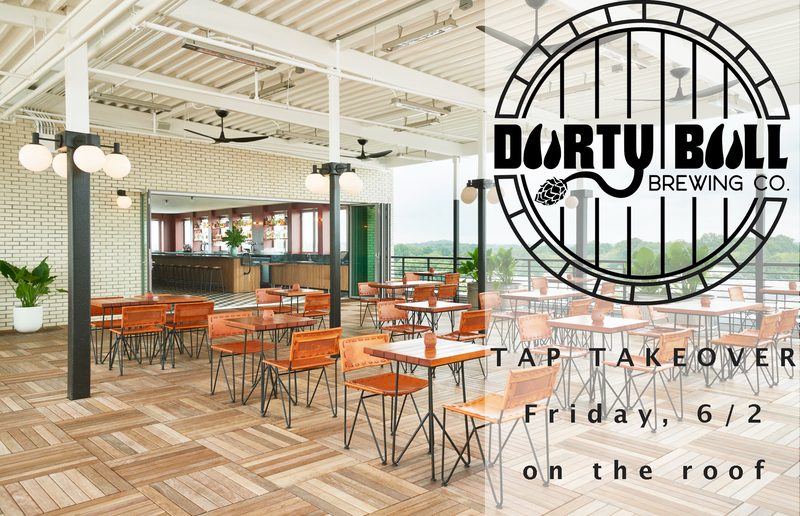 Join us on the roof Friday as Durty Bull Brewing Co. takes over our taps with 5 of their favorite brews. Named one of Beer Advocate’s best new breweries in the US , Durty Bull Brewing Company is a 15-barrel craft brewery and tasting room specializing in barrel aged & sour beers and other unconventional offerings. Blonde Sour Ale– This 6.9% ABV lactobacillus kettle sour is fermented with 100% Brettanomyces lambicus, then conditioned in an oak foeder. The beer possesses a bright crisp sourness with a fruity funkiness with hints of vanilla and oak. Sour Pale Ale – This dry-hopped wheat based Sour Pale Ale has notes of grapefruit throughout while still packing a hoppy punch. At 5.4% ABV this beer will appeal to sour fans as well as hop heads. Lager– Moderate hop bitterness balanced by the medium malt body from the addition of Munich and Vienna malts. At 5.6% ABV, it’s the perfect refreshment on a hot summer day. Imperial Rice IPA – This hugely aromatic IPA was brewed using 300 pounds of rice in the mash and was dry-hopped at 2 pounds per barrel with Nugget, Summit, Columbus and Polaris hops. It clocks in at 8.2% with a super dry finish from the addition of the rice which really allows the hops to shine! Red Wine Barrel Aged Brett Table Beer – Aged for 6 months in local red wine barrels, this beer is a blend of 2 different strains of yeast creating a distinct wine flavor and a dry effervescent mouthfeel. Aromas of grass and red wine with the classic mustiness of Brettanomyces dominate the nose. 5.6% ABV.